Emory Radiology trains skilled and compassionate clinicians additionally experienced as educators, researchers, and leaders, says Vice Chair for Education Mark E. Mullins, MD, PhD. After an internship, training advances in four highly competitive residency programs: diagnostic radiology (Christopher Ho, MD, program director), interventional radiology (R. Mitchell Ermentrout, MD, interim program director and Zachary Bercu, MD, interim program co-director), and nuclear medicine (David C. Brandon, MD, program director). The Medical Physics Residency, presented in partnership with Phoenix Technology Corporation and Alliance Medical Physics and led by Jonathon A. Nye, PhD, combines diagnostic imaging and nuclear medicine training to qualify graduates for practice as medical physicists in multidisciplinary teams. New fellowship programs in pediatric interventional radiology and imaging informatics join programs in abdominal, breast, cardiothoracic, emergency, musculoskeletal, and pediatric imaging; interventional neuroradiology; vascular interventional radiology; neuroradiology; nuclear radiology; and nuclear medicine PET in offering exceptional subspecialty training. The Medical Imaging Program, led by Theodore Brzinski, MES, RT(R), is only one of two baccalaureate programs in Georgia. It offers concentrations in radiology administration, radiography education, and advanced clinical practice with specialization in computed tomography, interventional radiology, magnetic resonance imaging, and women’s health (mammography and bone densitometry). Dr. Tigges has a candid discussion regarding visual virtual anatomy with Emory medical students. At the 2018 Radiology Medical Student Symposium, the panel discusses an inclusive vision for radiology. Emory School of Medicine students begin studying radiology and image-guided medicine in second-year electives like Clinical Correlation: Anatomy, Pathology, and Radiology. Next is the required virtual, integrated third-year radiology clerkship run by Stefan Tigges, MD. In their fourth year, there’s a four-week radiology elective administered by Eugene Berkowitz, MD, PhD, plus the opportunity for a radiology-related research project during their fourth year. Mentorship also happens through the Emory Radiology Interest Group (ERIG). Judith Gadde, DO, MBA, advises the group. In 2017, ERIG organized “Radiology into the Light: A Women’s Symposium,” which was well attended by medical students from Emory, Mercer, Morehouse, and Medical College of Georgia plus department faculty and alumnae. Faculty panelists shared their career paths and addressed issues such as work-life balance, academic versus private practice pathways, and mentorship. 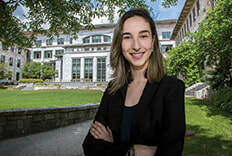 For Brianna Vey, MD, involvement in ERIG—she co-organized the women’s symposium—plus a radiology Discovery project and faculty mentoring helped her choose Emory for both her internship and diagnostic radiology residency. Emory Radiology residents are as diverse as they are accomplished. Recruitment efforts include Diversity Interviewing Days, which highlight the ways Emory is an especially welcoming and diverse community of scholars. The days are popular and effective. Emory’s Interventional Radiology Integrated Residency program not only matched with its top candidates in 2017 and 2018; the two classes comprise 50% women and minorities. Similarly, more than 50% of the Diagnostic Radiology Residency program’s 2017 and 2018 match classes are women and minorities. “Diversity in all its forms matters to us. It is what makes us such a wonderful place for residents to train,” says Dr. Ho. First-year resident S. Rafael Arceo, MD, agrees. He chose Emory both for its exceptional radiology training and its rating as a Top Performer in the Human Rights Campaign 2018 Healthcare Equality Index. The rating lauds Emory’s foundational protection in practice and policies for patients, visitors, and employees of the LGBTQI community. “It’s important for me to feel protected as an employee and for the healthcare facility itself to share my values of practicing inclusivity and non- discrimination,” he says. “Emory became my top pick after I met with faculty and residents and participated in a Diversity Day interview, where these values came to the forefront." Emory Radiology is expanding interventional radiology (IR) training opportunities. The first four trainees in Emory’s new Interventional Radiology Integrated Residency program arrived July 1st and four more begin in 2019. In 2018, Emory obtained ACGME accreditation for a two- year IR-Independent Residency with six slots for trainees who already completed a diagnostic radiology residency. Early Specialization in Interventional Radiology (ESIR) in the Diagnostic Radiology Residency program lets three fourth-year residents complete a specialized curriculum in preparation for advanced entry into the second year of the Independent IR Residency. Residents join faculty mentors at the 2018 AUR conference. Emory Radiology encourages its residents to develop more than clinical skills. 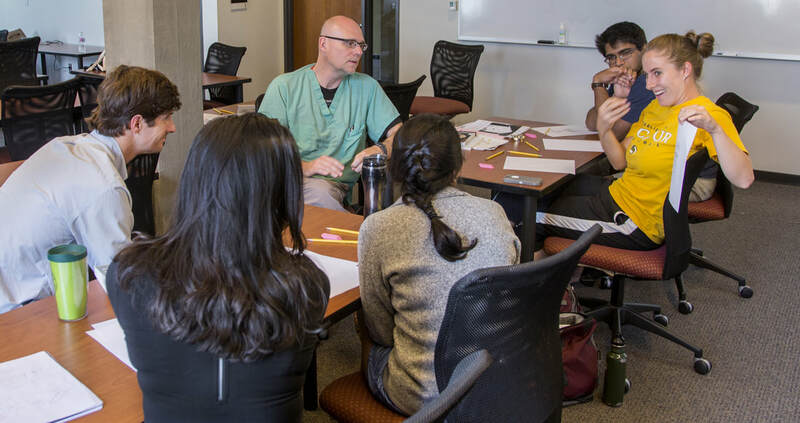 With funding and mentorship through the department’s Adopt- A-Resident program, enterprising residents are creating program tracks to more formally prepare trainees for rewarding careers as educators, researchers, informatics specialists, and, most recently, medical entrepreneurs. The vision is for residents to be well-rounded professionals with a broad range of skills needed to achieve their career goals. 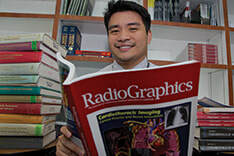 Dexter Mendoza, MD, always enjoyed teaching. 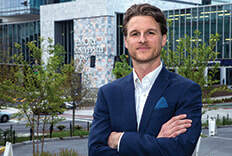 To prepare for an academic medical career, he thought residents like him needed a structured training program, so he proposed creating one and was awarded Adopt-A-Resident program funding to do just that. Dr. Mendoza designed the resident Clinician-Educator Track curriculum to include seminars and group discussions about learning theories, learning and teaching styles, providing feedback, developing curricula, mentorship, and research. A required capstone project for the track has germinated additional innovation. For his capstone, Dr. Mendoza created a curriculum for building an academic career using teaching and education research. His work resulted in presentations at the Association of University Radiologists’ (AUR) 2017 and 2018 conferences plus an article published in Academic Radiology. Resident David Theriot, MD, established a popular Friday morning resident teaching session this year for his capstone project. Mentorship facilitates success. Dr. Mendoza credits Dr. Mullins plus Adopt-A-Resident mentors Ryan Peterson, MD, and Meg Fleming, MD, for his own success. He, in turn, mentored residents as they progressed through the track, thereby ensuring a leadership pipeline. Dr. Theriot assumed track leadership July 1, and Fred Bertino, MD, succeeds him in 2019. ​Dr. Mendoza also inspired other residents to propose additional program tracks, and he appreciates the opportunity to be both inspirational and inspired. Patricia Balthazar, MD just began year three of residency, yet she already has 21 published journal articles and national awards like the AUR Trainee Prize, the ACR-AUR Research Scholar Award, the Radiology Alliance for Health Services Research (RAHSR) - Harvey L. Neiman Award, and the Radiological Society of North America (RSNA) Roentgen Resident/Fellow Research Award. She’s the founding member and chair of the Society for Imaging Informatics in Medicine (SIIM) Residents, Fellows, and Doctoral Students Committee, and she will become a chief resident for Emory Radiology in 2019. ​She also created a new Integrated Imaging Informatics Track (I3T) as an Adopt-A-Resident project for Emory Radiology residents interested in careers that maximize the quality and efficiency of imaging informatics technology and services. The I3T curriculum, approved in the spring for rollout in fall 2018, includes didactic instruction plus an informatics capstone project. Dr. Balthazar has been working on an operational informatics project to improve resident workflow ​and feedback during call. She also studied a data retrieval tool to find and list imaging reports with noncritical, incidental findings to improve patient follow-up; a successful pilot-test was presented at the SIIM annual meeting. Adopt-A-Resident 2018 grantee Alex Dabrowiecki, MD, is designing a Radiology at Emory Medical Innovation (REMI) Track, which combines didactic education with hands-on learning so residents can turn good ideas into marketable products. Lectures covering theories and tenets of entrepreneurship and product development will be augmented by skills-building team challenges. REMI-track residents also will conceive and develop a prototype technological solution with an accompanying business plan as a capstone project. Mentoring and technical support will come from the biomedical engineering program at Emory and Georgia Tech as well as from Emory Radiology faculty and Emory’s Office of Technology Transfer.